"Amrita" is Sanskrit for "nectar," and indeed, the Amrita owner's manual states that they are confident their speakers "will provide Nectar For Your Ears." 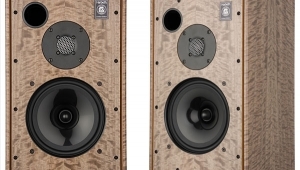 Although this Iowa-based manufacturer offers a large range of loudspeakers, I decided that Stereophile should review their small AMRIT-MiniMonitor ($875/pair) after Martin Colloms mentioned in his report from the 1987 SCES in Vol.10 No.5 that it sounded "pleasantly balanced on both rock and classical material." 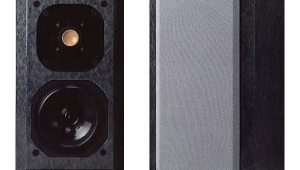 We received a pair for review in the summer of 1988, but it turned out that only one was working, the other having a very restricted low-frequency response below 100Hz. After repeated requests for replacements, Amrita's John Andre personally delivered a pair to Santa Fe in the Spring of 1989. This time, both worked out of the box! 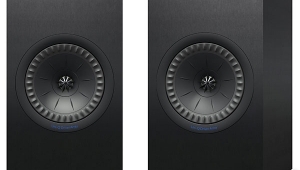 The AMRIT-MiniMonitor appears to be a conventional two-way design, using a 1" soft-dome tweeter (sourced from Morel in the UK) asymmetrically positioned on the baffle, and an 8" plastic-cone woofer with a foam half-roll surround. In fact, two woofers are used, the second being positioned behind the first, with an enclosed airspace between the two cones (see diagram below). According to Amrita, they have applied for a patent on this "compound" configuration, but I would be surprised if it were granted, as it was first proposed by Harry Olson in the 1950s. 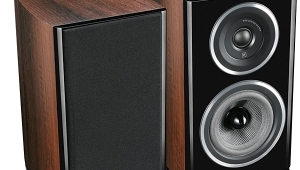 Linn has also made use of it in their "Isobarik" speakers, even patenting the idea in the UK, and Mitsubishi recently applied its use to in-car loudspeakers (footnote 1). 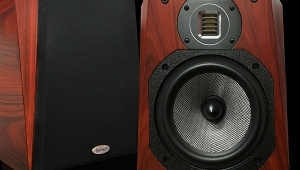 When properly implemented, this technique usefully modifies a speaker's low-frequency response, being used, all other things being equal, either to reduce the size of enclosure needed for the same LF extension, or to increase the extension for the same cabinet size. The disadvantages are that it doubles the drive-current required from the amplifier and increases cone excursion for the same sound-pressure level. It also makes the low-frequency performance more critically dependent on the drive-unit parameters: change the cone mass slightly and the response will change to a disproportionately large degree. In the case of this Amrita, the two Danish-made woofers are also loaded by a reflex port some 8" long and 2" in diameter positioned at the top of the cabinet rear. The crossover uses high-quality components, including Solen capacitors, and features first-order filter slopes. The high-pass filter for the tweeter is glued to the rear of the terminal boardtwo pairs of five-way binding posts are provided to allow bi-wiring or bi-ampingand in addition to the series capacitors, the tweeter is shunted with a capacitor/coil network. 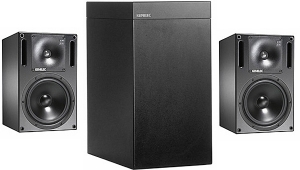 The woofer crossover components are glued at various places around the cabinet interior, and comprise an air-cored inductor in the front woofer feed and a ferrite-cored inductor in that to the rear woofer, presumably to roll its response off before the midrange. There are also Zobel RC networks shunting each woofer. The internal wiring looks like original Monster Cable but is actually sourced from "Super Sound By Saxton." 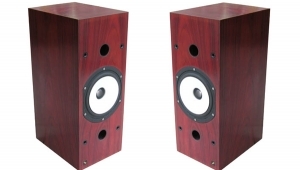 The cabinet is built from oak-veneered fiberboard (many other veneers are available) and is extensively braced, not including the internal sub-enclosure between the two woofer cones. 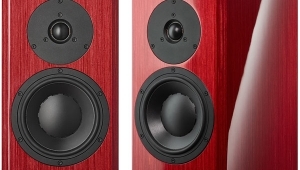 Amrita suggests that the speakers be positioned well away from rear and side walls, facing straight ahead rather than toed-in to the listening seat. They also suggest that in a live-end/dead-end room, the speakers benefit from being sited in the live end, the dead end being to the listener's rear, which is the opposite to convention. In my listening room, which is generally live, though with an even decay characteristic, I ended up with the Amritas around 3' out from the rear wall (which is faced with books and LPs) and 5' in from the sides (also faced with bookshelves), this forming a rough equilateral triangle with the listening seat. The most important consideration with speakers such as these is what stands to use. 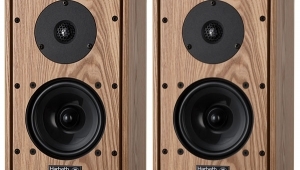 Often treated as an afterthought, a good pair of stands is fundamental to getting optimum performance from even inexpensive loudspeakers. I used 18"-tall Celestion SLSi stands, their center pillars each filled with 30 lbs of lead shot, topped up with sand. (These are single-pillar designs, with steel top and bottom plates.) 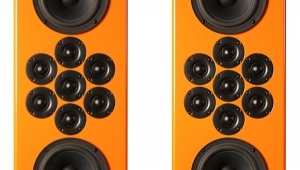 The stands were fitted with floor spikes, and each speaker was coupled to the stand top plate with small blobs of EZ-Tak, a not-very-reactive damping compound. In a telephone conversation, Amrita's John Andre suggested that 20" stands would be appropriate. Accordingly, I had no doubts about using the 18" Celestion stands with these speakers, though the tweeter did seem a little low. However, with my listening chairs placing my ears 3436" from the ground, I had to slouch slightly with the Amritas to place the tweeters at ear height. I originally tried toeing in the speakers, but the smoothness of the midband suffered. 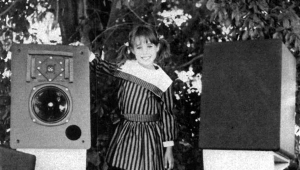 Eventually, I used the speakers facing straight ahead, with the tweeters on the outside baffle edgesthe speakers are supplied as a mirror-imaged pairwhich I felt to give the smoothest treble response. 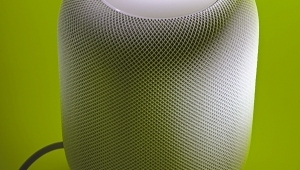 As the grille consists of cloth stretched over a wooden frame, foam inserts being used to try to minimize reflections, I did the bulk of my listening with the grille removed. Spoken male voice is generally my first test of a loudspeaker. The Amritas were revealed as adding an "aww" coloration, with a degree of sibilance exaggeration endowing the man's voice with a slight lisp. The upper bass, however, didn't suffer from boom. The positioning precision of what should be a narrow central image was not impressive, treble sounds spreading to the sides a little. Moving on to female singing voice, again the treble content of the singer's voice splashed to the sides, center imaging being quite unstable. A "hooty" quality thrust the image forward at the listener, there also being noticeable overhang on some notes. Naturally recorded piano (my own recording of Anna-Maria Stanczyk playing Chopin on the original HFN/RR Test CD) also revealed the AMRIT-MiniMonitor to have restricted image depth and imprecise lateral imaging. Again, some piano notes, from 500Hz800Hz, literally leapt forward from the soundstage. The Stereophile flute-and-piano LP proved the clincher: neither the sounds of flute nor piano bore much relation to the sound I had heard live in the hall and that Kavi Alexander had captured on tape. The flute, in particular, acquired a "reedy" tonal color quite alien to the instrument's true sound, while its central image, which generally sounds very narrow, significantly splashed to the sides of the soundstage at some frequencies. The piano, which is beautifully set back in the soundstage when reproduced by Spica TC-50s, was presented in the same plane as the flute and sounded too "boxy." Low frequencies had obviously good extension, organ pipes having a powerful sound. The upper bass, however, sounded a little thin, robbing the sound of dynamic impact on low-pitched drums. 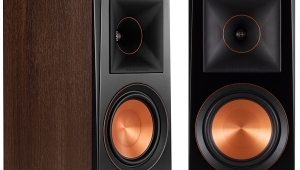 The speaker does have a superficially "loud," exciting character which some might find impressive, the sound certainly grabbing the listener's attention. But over time, this quality becomes fatiguing. This Amrita will absorb a lot of power and will play very loud for what is still quite a small speaker, but its rather "shouty" mids have you reaching for the volume control long before the bass, for example, shows any sign of stress. I could go on, but, all things considered, the AMRIT-MiniMonitor is sufficiently colored in the midband and features such poor stereo imaging that there would be no point. 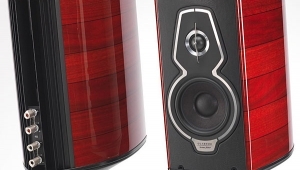 At its price level, the competition is just too stiff for this speaker to be considered a contender. Attractively finished and well made, the Amrita AMRIT-MiniMonitor proved disappointing in its fundamental sound quality. 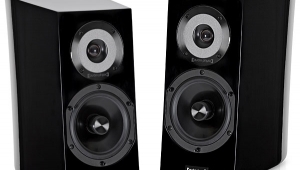 While the treble is quite clean, and the bass extension good for the enclosure size, the speaker lacks dynamic impact, its image focus is poor, and the midrange is thrust forward at the listener. In addition, the level of resonant colorations in the midband colored the sound to the extent that I found it hard to listen for any length of time. Not recommended. 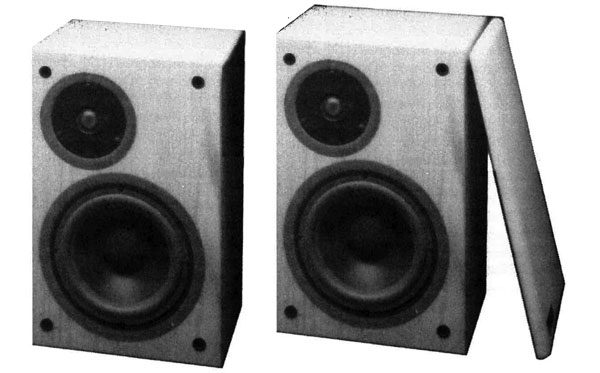 Footnote 1: See "A Compound Loading Loudspeaker System," Noboru Kyouno and Susumu Fujiwara, AES Preprint 2738. Preprints are available from the Audio Engineering Society, 60 East 42nd Street, New York, NY 10165. Web: www.aes.org.